Adjust the tripod leg length for proper tripod height. Hand-tighten the leg tensioners, making sure each leg is firmly locked. WARNING: Wood can shrink or expand with changes in humidity. Heating and cooling systems can rapidly change humidity levels, which can cause the leg clamp pressure to change. Clamps that were tight last week may be loose today- which could cause a tripod to topple over. Re-check leg clamps occastionally to be sure they are tight. The tripod must be level- all legs should be adjusted to the same length, unless the terrain is uneven. The legs should be spread outward to their maximum angle. The spreader that connects the three legs should be at maximum extension for greatest stability. Once the binocular is mounted on the shaft, do not attempt to make large adjustments in tripod height. 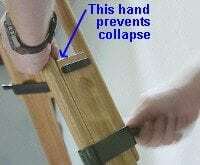 Small adjustments can be carefully made by using one hand to grip the upper part of the leg to act as a temporary “stop” when loosening the leg tensioner. Move each leg no more than two inches at a time to prevent the tripod from becoming unbalanced. We recommend that you do not attempt to move the tripod to a new location with the binocular still mounted. Many of our binoculars are used in vacation homes. If you will be leaving your binocular unattended for long periods of time, we recommend that you remove the binocular from the tripod to prevent the possibility of an accidental tripod collapse from changing humidity levels.